Broadband Power for the People? The year 2011 appears destined for revolutions. As Egyptians, Libyans, and others demonstrate across the Middle East and North Africa, Canadians are unleashing a quieter storm of their own. Hundreds of thousands have signed an online petition that calls for rescinding a new Internet billing policy that would eliminate price caps and bring usage-based charges. Striking the policy would help protect the interests of Canadian consumers – and the government seems to be listening. A senior government official indicated that if the Canadian Radio-television and Telecommunications Commission (CRTC) does not reverse its controversial ruling, then the Cabinet would do so. The policy, which would take effect on March 31, centers on the amount of data that consumers can view or download and for what expense. Not surprisingly, it’s the bigger ISPs that support the new fees supported by the policy. Many have already been charging users in accordance with how much data they access – and now, the new law would have smaller ISPs do the same. That’s because smaller ISPs lease bandwidth from larger telecommunications firms such as Bell Canada, Rogers Communications, and Shaw Communications. Despite their small size, the lesser-known ISPs (Internet service providers) have typically been providing both greater bandwidth and lower fees than have the bigger ISPs such as Bell and TELUS. The larger telecom firms are mandated by government to lease their bandwidth to smaller ISPs and resellers. However, until now, they were prohibited from passing per-gigabyte fees on to these customers. The Canadian Radio-television and Telecommunications Commission (CRTC) has attempted to placate small providers by granting them a 15% discount on cable and telecom companies’ retail rates – but the small ISPs are less than impressed with this wholesale rate. In fact, many regard it as just another retail price. From the perspective of small business, the discount is hardly compensation for the new power imbalance: it merely slows the journey toward an Internet oligopoly or monopoly. The large companies, in turn, cite their right to manage their networks – and they claim that flat-rate Internet pricing is no longer viable. Bell Canada raised the issue in 2009 as iTunes, YouTube, Netflix, and other online video and video game providers contributed to rapid growth in online traffic. But that’s a hard argument to swallow: according to the CRTC’s own data, just as some large providers have been charging for “excessive” traffic for years, smaller ISPs have offered plans with literally hundreds of times the bandwidth, if not unlimited service, at a lower cost. The question of exactly what is the just balance between fostering competition and granting corporate rights will always be up for debate. For now, however, it seems that Canadians have drawn a line in the sand. In addition to more than 465,000 having signed a “Mind the Cap” petition online, tens of thousands have written to the Minister of Industry to protest the imposition of usage-billed Internet billing. And as back-up, the Canadian Network Operators Consortium, a group of more than 20 ISPs, is considering its legal options if the Conservative government does not revoke the CRTC ruling. A senior official acknowledged that the billing is “a bread-and-butter issue” and would be treated as such. Many Canadians currently have Internet plans that charge for using an excess of 25 gigabytes per month. That’s equivalent to watching about five Netflix movies or downloading about six video games. It’s certainly not enough for many people’s entertainment needs, nor is it sufficient to help get a small business established or draw innovative services. For instance, a data cap would stymie the expansion of Netflix, the online video company that recently started offering unlimited movie rentals for about C$8 per month. By striking down the decision, the government will enable the small ISPs to remain competitive and thereby help bring a variety of affordable Internet options to Canadians. At the same time, eliminating caps will help attract innovative digital entrepreneurs to the Canadian economy. It’s inspirational – and if US Americans would pay attention, perhaps the Canadian revolution could spread stateside. Regardless of their political stripes, fair Internet pricing is something that just about every consumer can stand for. Arthur Czuma is a writer and consultant for several Ontario-based businesses including Distributel, a local ISP. Usage Based Billing has NOT been cancelled, only postponed. The CRTC is not doing their job, but rather doing a disservice to Canada. If you haven’t already, sign the petition. There are only 15027 signatures. If you have already signed, who else should you be asking to sign? That’s easy: anyone who uses the Internet. Because Usage Based Billing will harm not only Canadians, but our Economy. After all, they work for us, don’t they? The first question posted on the new UBB Question page is from Paul’s two part question that I think requires a three part answer. Does Bell currently charge its own customers with a Usage-Based Billing method, and is simply seeking permission to extend this to its resellers? Or is it seeking permission to use this model, even with its own customers? Bell does currently charge their own customers UBB along with caps. That is to say, the customers who are not still on the Unlimited packages that Bell originally entered the Internet market with. In May I looked at what packages Bell offers to new customers customers in the article Why Do Bell and Rogers Have Customers? The CRTC’s attitude seems to be that Bell is within their rights to do pretty much whatever they want to their own customers without seeking CRTC permission. This was made very clear with the issue of “throttling”; the CRTC had no problem with Bell throttling their own customers; it only came up as an official CRTC matter when the Independent ISPs complained that Bell was throttling their customers. Personally, even though I am (thankfully) no longer a Bell customer myself, I think this is wrong. If Canada is to have a regulatory body like the CRTC they should be charged with looking out for the best interests of ALL Canadians, including Bell customers. When any retailer behaves badly citizens ought to have recourse. Where does BellAliant fall into this? The two primary ISPs in Atlantic Canada are BellAliant (a merger? of Bell with the previous telco, Aliant, which itself was a merger of the individual provincial telcos), and EastLink (cable provider). Would BellAliant be considered a reseller, is it considered “Bell”, or does it fall outside the scope of this ruling? Knowing this would be quite helpful for rallying local politicians. As a consumer, I do not presume to know the ins and outs of the labyrinthine relationships of Bell companies. Bell may wish to give the impression it is not simply one very rapacious corporation with an unacceptable amount of power and influence, but rather a group of smaller corporations. But it certainly appears to me that that Bell Aliant is part of the “Bell Family” of companies. And in Canada’s west end I have just as much trouble seeing actual differentiation between Bell and Telus, a corporate entity which certainly looks and acts like yet another incarnation of Bell. There may be separations on paper but from where I sit Bell is one behemoth wearing two hats: that of the carrier that controls the telephone wires and a second hat as Internet Service Provider. The idea is that these are supposed to be two separate business entities, but the reality is such that even the CRTC no longer pretends to believe this. [In actuality it is even worse than this. Much much worse. Not only does Bell also wear a “Cell Phone Provider” hat they are also well on their way to wearing a really big “Media Mogul” hat IT World Canada: Bell Canada back in the content business with CTV bid which is undoubtedly a huge part of why Canadians are not being informed about this and other equally crucial issues to our future. As a writer, I understand the power of the language to slant our perceptions. This is part of why there are so many issues around the jargon of this new technology. And if having to cope with brand new terminology wasn’t bad enough, Bell makes it worse by using some terminology differently than ISPs in other parts of the world do (“throttling, for instance). This certainly helps to muddy the water. In order to discuss any of this effectively we all need to be on the same page. Paul asked good questions, but I think it is equally important to address the question he did not ask: what are Independent ISPs? It is a serious mistake to call the Independent ISPs “resellers”. Bell’s ISP competitors should more properly be called Independent Internet Service Providers. Because the Independent ISPs provide consumers with access to the internet, the same as the Bell or Cable ISPs do. Internet Service Providers provide consumers with access to the Internet. They sell us access. The Independent ISPs are wholesale Bell Canada GAS customers. The reason calling the Indie ISPs “Bell resellers” is a problem is that it implies Bell has a proprietary interest in the Internet. And while I expect Bell would like nothing better than total control of he Internet, Bell does not own the Internet. Bell owns part of the Internet infrastructure (cable and equipment) on Canadian soil. Bell owns this infrastructure only because successive Canadian governments gave Bell priviledged status and protection from the beginning. I expect there were government subsidies as well as made laws allowing Bell to run wire across private and public property alike to ensure Canada could participate in the 20th Century with a nation wide telephone network. Bell owns the telephone wires over which we make our phone calls. This does not mean Bell owns our phone calls. By the same token, Bell does not own the Internet. As a backbone carrier, Bell simply controls the wires. When the Internet was initially opened up to consumers in Canada, the original Internet Service Providers provided consumers with Internet service across the same telephone cable. Nobody called them “resellers” then. This was before Bell decided to enter the market with their own newly minted ISP which put all the original ISPs out of business by offering Unlimited Internet packages… For more detail on the history of how we got here in my Canadian Market said NO to UBB article. Except now, with CRTC approval of Usage Based Billing, Bell the carrier has been granted the power to dictate costs and pricing schedules to the Independent ISPs that directly compete with Bell the ISP. If you haven’t already, sign the petition. There are only 11316 signatures. The Internet is an interconnected network of wires connecting computers all around the world. The physical conduit of the Internet is the telephone wire or cable and associated equipment that connects together to form the “infrastructure” or “backbone”. Because Canadian communications systems must cover great distances to serve a relatively small population these systems have traditionally required special treatment in order to provide Canadians with the services we need to both exist and compete in the first world economy. Although Canada has never had a strict telephone monopoly, from the very beginning different telephone companies provided services in different geographic locations across Canada. Which means we have for the most part had a “virtual monopoly” because each geographic area had only one telephone provider. Regardless of what Canada’s telecommunication regulator the CRTC seems to think, if you have to sell your house and move to a new geographic location in order to get a different Internet Service provider it does not qualify as “consumer choice”. So although we have different companies providing access to the Internet, a great many Canadians have only one possible Internet Service Provider. Somehow Bell Canada never seems to mention that the only way the telephone system we have today could have come into existence was through the goodwill of private property owners and government cooperation. They like to take all the credit for establishing the phone/cable infrastructure, but they could never have done it without our help. Because the thing to remember is that telephone poles carrying telephone wire cross private land. Had stringing the wire been left entirely up to the telephone companies, we might still be using smoke signals. Because without government assistance, the phone company would have had to negotiate with every single land owner. Individual property owners would have been able to prevent the telephone wire from crossing their land. Instead of ending up with a system covering all of the settled portions of Canada, we might have ended with many small unconnected pockets of telephone service. Because as sure as the sun rises in the east, even today there are people who don’t want telephone service. Certainly some would decline for religious reasons, while others might try to pry excessive sums of money from the phone company in exchange for granting a right-of-way across their property. To prevent such snags which might have rendered the existence of the telephone system impossible, forward thinking government mandated “easements” along the road side portions of private property. This government intervention allows utilities like electricity and telephone companies to put up poles along these easements and then string wires along them, or dig up land to allow cables or pipes to run under this land for the public good. In this way, the government acted to ensure Canada’s technologically wouldn’t lag. The “who owns the wire” problem is not unique to Canada. Even in countries with dense enough population to support telephone competition it only makes sense to string one wire. Property owners can be persuaded to accept one set of telephone poles running along their land for the common good, but would balk at 5 sets of telephone poles. So even where there are five telephone providers they share the wire. When I was a kid, my Dad took us to a local university to see a gigantic machine that could solve mathematical equations if you fed it punch cards. Punch cards were exactly what they sound like: bits of cardboard with holes punched in them. The computer programmer communicated with the computer via punchcards. The pattern of the holes made up the program. Back in those days of vacuum tubes, most people could not imagine the possibility that personal computers would ever exist. Computers were simply too big. But then came miniaturization. Really, weren’t the first home computers was actually the digital calculators that swept over the world in the 1970’s? With the ability to achieve miniaturization, home computers were not far behind. The first home computers were DIY projects; if you wanted a computer you had to put it together. So naturally the first people to have home computers were the techies who could build them. But it wasn’t long though before enterprising businesses began selling personal computers or PCs that anyone could use. Spreadsheet programs like Lotus Symphony revolutionized the accounting Industry. Desk Top Publishing was born. Games could be played. Calendars kept. The possibilities seemed endless. And they were. Today ordinary people get personal computers in much the same way we get cars. We no longer need to know how to build or repair one. In the early days of personal computing, people could purchase modems that would connect computers via telephone lines. When your modem was connected to the phone line, it took control of your telephone service. When your computer was talking on the phone, you couldn’t. It got to the point where some computer users would get a second telephone line so their computing time wouldn’t tie up their telephone. Before the Internet became available to ordinary people, there were independent computer networks. My first venture online was in 1989 with a commercial service called Compuserve. Although the research possibilities were excellent, the fun part was being able to live chat with folks from around the world. The downside was that it was terribly expensive. You paid by the minute, which can add up quite quickly. Learning how to do anything took a lot of time and every minute online cost money. Although it was fun, being fresh out of college, I simply couldn’t afford it. So I went off line again. The public library was a much more economical place to do research. I just went to search out Compuserve now. I’m happy they’re still out there. Oh and look… the deal I see is 2 months free to start and after that $17.95 per month unlimited. Twenty years ago my bill for a single month exceeded $100, and that was using one of their more economical billing plans! Times certainly have changed. Later I became involved with an early computer network, a BBS or “bulletin board system”. These independent computer BBSs were very similar to the Internet forums of today; you posted your comment and it stayed there. People would check in over time and join in the conversation. No live chats here. But it was an excellent antidote to Compuserve, because it was free. Voluntary donations helped support the system by paying for improved equipment for the people running it. A BBS was not a commercial venture, they were communities… today we’d call them social media… started by a few people with computer know-how and equipment to run it on. People found out about a BBS by word of mouth. Then as now content was important for finding and then keeping an audience. The people who owned the equipment controlled the BBS, and acted as the system administrators or SYSOPS. But it was the users who brought the BBS to life by beginning new discussion areas and posting conversations and content to the BBS. Because it didn’t happen in real time, the posts were often more thoughtful than live chat. But the owners held ultimate control; they could cut off anyone for any reason. Initially this power was only used to clamp down on abusive behavior; there were online Trolls then as now. Later on personalities and personal politics came into it. My disillusionment coincided with one heavy contributor being cut off simply for having different attitudes and philosophies– mostly he annoyed the owners. But because he provided so much content and administered so many discussion groups, they didn’t want to cut him off for good, so instead they gave him small suspensions to keep him in line. That type of petty abuse of power is why I left that BBS, and has a lot to do with why I support net neutrality today. That was around the time when the Internet became generally available to the public. Overnight there were Independent Internet Service Providers springing up all over Canada, and around the world. And although many people signed up, it was far from universal. There were many seductive elements. Email and Instant Messaging held great appeal. Instant connectivity. Research, information… everything at your finger tips. But in many ways it was a luxury. A plaything. It was only later it became a necessity. In my recollection, a lot people were initially resistant to going online because it was so expensive. There were many many ISPs, and so competition was fierce. Even so, it was still very expensive. ISPs charged by the minute. The most persistent and pervasive ISPs battling for customers was America Online. They must have mailed out hundreds of thousands of AOL sign up CDs. Maybe millions. I know I didn’t start keeping the CDs that kept turning up in my mail initially. Yet I still probably have around thirty of their CDs. Yet I never did sign up with AOL. 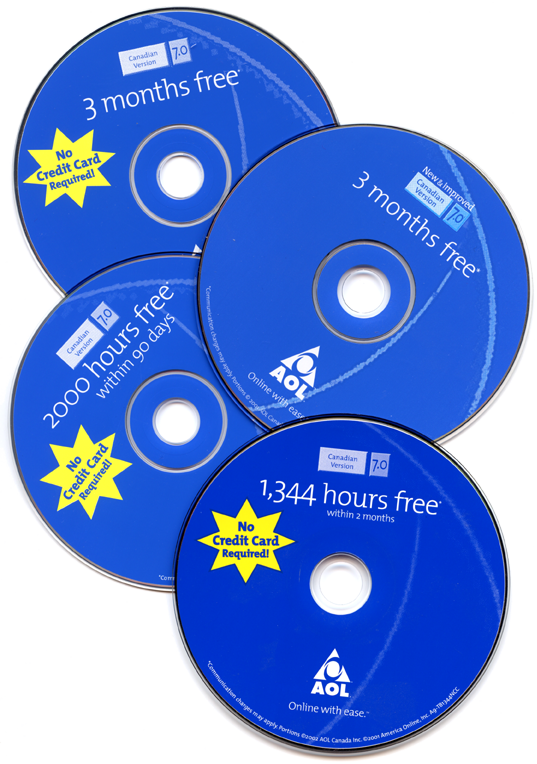 I knew from my Compuserve experience how quickly the usage costs could add up, and how expensive it would be. Not to mention virtually impossible to budget for. The AOL marketing campaign is writ large across those old CDs. 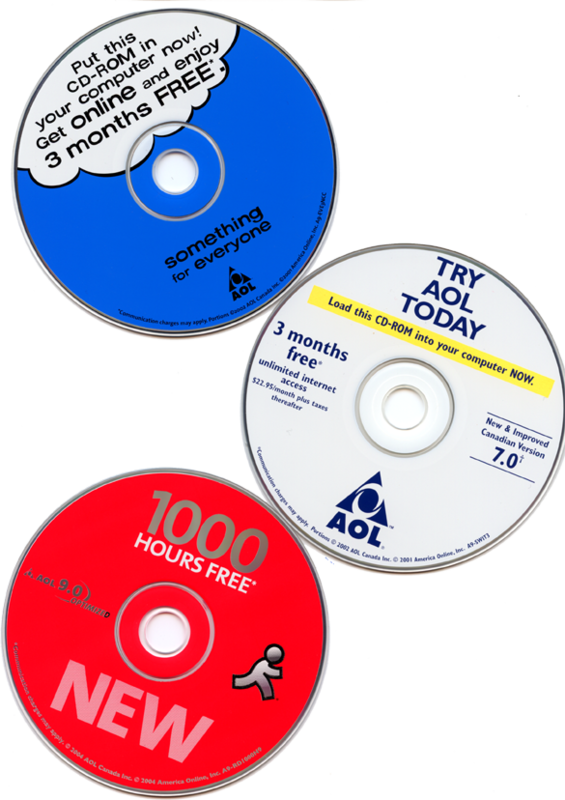 AOL tried giving better and better introductory offers but it just did not work. After the early adopters, the techno types who would do whatever it took to be online — and more importantly pay whatever had to be paid– the mostly ordinary people just weren’t interested. It was a big cash outlay, after all. Just getting a reasonable computer system cost around three thousand dollars. My first PC had a double floppy drive — not even a hard drive — a black & white screen — a dot matrix printer. Three grand. After laying out the green, most of us weren’t ready to sign away the rest of our disposable income for the Internet. Because after AOL’s “introduction period” was over, it would be back to the very pricey Usage Based Billing options. It just cost too much. And there wasn’t even the content available online that there is today. Certainly finding what you wanted took work, and learning is very expensive when you’re being billed per minute. The point is, you didn’t NEED to go online. You could buy a whole encyclopedia on one CD, or a spreadsheet program, a word processor or graphics software or games, and your computer could do everything you needed it to. People didn’t need the Internet. It was just too expensive. A toy. What happened to AOL? The king of marketing? At one point they were the one to beat. They marketed the heck out of the Internet. Who else could afford to scatter CDs across the land with such bold abandon. Or convince respectable venerated Canadian banking institutions… notably some of the most caution in the world… to partner them? What cataclysm could have done for AOL? What happened to all those ISPs? Bell Canada and Rogers Cable entered the fray. Bell Canada was the major telephone carrier; they controlled and maintained the telephone cable backbone. Telephone traffic traveled over this wire, and now Internet traffic did too. Up until this time, Bell Canada just had phone lines, they were the major telephone carrier who controlled the wire backbone connecting home computer users to the Internet. But now, Bell decided they wanted to get into the internet game. So Bell hung out a shingle as an Internet Service Provider, or ISP. When Rogers entered the market they brought their own backbone in the form of urban cable connections. The first time I recall hearing about Rogers as an ISP they were offering high speed Internet connections. I wasn’t paying much attention back then. One minute there were scads pf Canadian ISPs and the next there were only two. elimination of usage based billing allowed the Canadian Internet Market to really take off. Canadian consumers told the market in no uncertain terms that we did not want the Internet on a Usage Based Billing model. Low cost entry into the Internet made Canadians embrace the Internet. This is why Canada was an early adopter, and a leader in Internet use. Even though it didn’t take long for prices to climb. Since the other competitors were gone, Bell and Rogers had the market carved up between them so prices began to rise rapidly. The Internet has impacted on just about every type of business there is. We buy and sell on eBay or Amazon. We pay our bills online. We can read Canadian laws online. Get up to the minute weather reports. We watch TVor read the newspaper online. Canada Post is offering to deliver email. Because customers overwhelmingly chose “Unlimited” over the usage based pricing model, Bell and Rogers got the added bonus of eliminating the competition. Bell and Rogers were vying for supremacy so they built good infrastructure to offer the fastest best service. Back then, Canada had some of the best Internet access speeds at some of the lowest prices in the world. This is a very large part of the reason that Canadians embraced the Internet so whole heartedly. But the upshot is that Canada was left with only two ISPs. It was such a monumental error that even the Canadian Government noticed, and stepped in and told Bell and Rogers that they would have to share the infrastructure so that competitors could enter the Internet market in an attempt to re-introduce competition. I’m not quite sure why, but it seems that all the Independent ISPs seem to get their Internet connection through Bell. When Bell set up the “Gateway Access System” (GAS) through which they sell wholesale bandwidth to the Independent Internet Service Providers The CRTC allowed Bell to set their own prices. Naturally they set very high prices. The Independent ISPs could then redistribute the bandwidth however they saw fit. At first Bell was happy since they were making money from their GAS business. They were probably surprised that the Independent ISPs provided low priced packages and good Internet service without gouging that have built loyalty for the Independents. It’s funny how just about anyone you ask has at least one Bell or Rogers horror story in their repertoire, but I’ve never heard any about the Independent ISPs. Canada’s place as an Internet leader has been slipping badly. Although Bell has done basic maintenance on their phone/Internet infrastructure they seem to have neglected the continuous upgrading they should have done. In real terms that makes Canada’s Internet service of today hopelessly out of date. What was cutting edge 15 years ago is paleolithic today. Although the service has stayed the same with little or no infrastructure improvements Canadian Internet costs have been climbing. Many Canadians went online because it was affordable back then, but that is no longer true. Now, at a time when it has become more important to go in the Internet– to do our banking, pay our bills, find jobs, do school work– today Canadian Internet rates are some of the highest in the world. The Internet is no longer a luxury, it is a necessity for Canadians. But not all Canadians can afford to even go online. The “digital divide” is yawning already, but now it’s about to get even worse. Because the CRTC has approved Bell’s application to begin Usage Based Billing. Real costs have nothing to do with it. Market forces have nothing to do with it. The CRTC will allow our Internet rates to double to economically force Canadians to reduce Internet use. If you haven’t already, sign the petition. There are only 10925 signatures. The two month public Canadian Digital Economy Consultation ended last week. Canadians were asked for input on how we want our Government to proceed with Digital Economy policy. Until you contrast that figure with the more than eight thousand Canadians who made submissions to last year’s Copyright Consultation. What happened? Why was there so little participation for this public consultation? The complexity of the Digital Economy Consultation leads me to the conclusion that it wasn’t put together in a day, rather it had been in the works for quite a while. Yet I didn’t see any publicity build up. It was announced and launched with lightning speed. By the Federal Government. Was the timing a deliberate attempt to to distract Canadians from our outrage about “Bill C-32: the Copyright Modernization Act” ? The Digital Economy Consultation made it emphatically clear that copyright would not be considered a valid topic. People who used the discussion forums complained that any copyright discussions were quickly shut down. This position would have been perfectly reasonable if the Government kept of copyright and the digital technology issues separate. But the Government’s own draft copyright legislation Bill C-32 strayed from the realm of copyright into the world of digital locks– and in fact subjugates all copyright to DRM/TRM. First the Government dissolved the division between the two areas and then they refused to allow discussion of the ramifications. Clearly copyright should have been an acceptable topic for discussion in the Digital Consultation. Disallowing it resulted in a credibility loss. After all, the magnificent response to the Copyright Consultation was not what the Government wanted to hear. Certainly they didn’t want to hear it all again in the Digital Economy Consultation. Did they set out to make this Digital Economy Consultation deliberately difficult, precisely to discourage ordinary Canadian citizens from speaking up? Certainly the Government raised barriers to participation for the Digital Economy Consultation. First Barrier: almost no lead time. The Digital Economy Website was announced and then it was underway. Second Barrier: Quantities of prerequisite reading. A lot to read onsite, beginning with the Consultation Paper Improving Canada’s Digital Advantage: Strategies for Sustainable Prosperity. Copied into Open Office it ran 32 pages. The digitaleconomy.gc.ca site was bursting with links to reference material (much of it government web pages). It listed rules and regulations, defined the terms of the consultation, provided News, FAQ’s and forums, although I never saw them since there just wasn’t enough time. There was a fair bit to read and think about before participating in the online forums or making a submission. Which would have been fine except for the time limit. Either the consultation period should have been substantially longer, or the reference and background material should have been made available online for at least a couple of weeks before the Consultation even began. The last problem was the submission form itself. Unlike the Copyright Consultation where you could answer all the questions in one submission, the Digital Economy Consultation was segregated into different categories. You had to choose one category or another. Some people made submissions in more than one category, and some answered questions for all the categories in one submission. Either way the very process was awkward, and more difficult than it had to be. Did they actually want submissions? My submission was the first posted after the extension. I could have made it in under the wire– there was an hour left to submit when I finished– but once I saw the Consultation had been extended I chose to take the time to proof read. When my submission was posted it was disappointing to see my summary wasn’t included. Instead a portion of the submission was extracted. So I uploaded it a second time. When my resubmission appeared it was added to the submission page without replacing the original. Multiple drafts of the same submission appear to be separate submissions. A few submissions were made in both official languages, and both these appear as individual submissions to a casual perusal, again making it look as though there were more submissions. It took quite a bit of effort just to separate the organizations from the individuals. Initially I thought it would be a simple matter to scroll through the submissions page. In many cases the extract didn’t clearly indicate if the submission was on behalf of an individual or an organization, making it necessary to read the entire summary, or even the submission. And even then there were some I still wasn’t entirely sure of. When I noticed new submissions being added, I was curious if any submissions had been expunged, so I ran the URL through archive.org’s the WayBack Machine. This is an excellent online tool that makes digital snapshots of the web for safekeeping, and allowing for web searches into the past. But it seems the Canadian Government doesn’t allow this kind of oversight since they’ve elected to disallow robot searches. The Government’s decision to lock out the Wayback Machine means Canadians have no way to tell if submissions have been quietly removed. Or not. Even so, you don’t have to be a statistical analyst to see that there weren’t very many submissions at all. Discounting duplicates, only 52 submissions were submitted before the original deadline. Which sounds like an excellent reason to extend the deadline. After all, over 8,000 Submissions were made to the Copyright Consultation. At the eleventh hour, the Government extended the deadline for four days. During those four days another 206 submissions were made, bringing the grand total up to 258 submissions. Before the deadline, individuals made 18 of the submissions while organizations made 34. Around half. After the deadline extension, individuals made an additional 18 submissions, while organizations made an additional 188 submissions. That’s a stunningly different ratio, with only ten percent of post deadline submissions being made by individuals. Four days was an odd amount of time to choose for an extension. Last year’s Copyright Consultation announced a 48 hour “grace period” to allow all the submissions to get in. Of course, the government site was being overwhelmed by the volume of last day submissions which resulted in an enormous backlog. In a perfect world I would have liked a week to make the best submission possible, because I think it would probably have taken a week — full time — to do it properly. So four days wasn’t really enough time for most people to come up with a comprehensive full fledged submission from scratch. But four days might be just enough time for a team. Clearly this isn’t the case for organizations because they can spread the work around. I have to wonder why so many of these organizations came in after the initial deadline. Is it possible that some organizations didn’t even start a submission before the deadline? Was the deadline extension to allow entities government friendly entities an opportunity to whip up quick submissions to slant the results of the Digital Economy Consultation in the direction the Government always intended to go? Or perhaps some submissions came in deliberately too late for discussion in the idea forum? The Digital Economy Idea-Forum on the website was shut down at the same time as the submissions deadline, leaving no official place for discussion of these late submissions. Perhaps some of the late submitters hoped to avoid public scrutiny. I don’t know the answer to these questions, but I am curious. Was this consultation doomed from the beginning by stacking the deck? A small trickle of additional submissions are being added. A new one today. There was one yesterday, none the day before, one the day before that. Why are submissions being added after the Consultation closed? This is the digEcon, not the copycon. It isn’t like the government is snowed in under the response– far from it. The amount of digEcon registrants was a quarter the number of submissions made for the copycon. It was plausible that it would take some time to get all of the copycon submissions online. That is certainly not true here. If these submissions were actually submitted before the (extended!) deadline, there doesn’t seem to be any legitimate rationale as to why it’s taking so long to include them. Particularly as submissions were accepted via the digEcon site’s online form. What possible justification is there for these submissions to be posted one at a time? The most reasonable supposition is that they are still being submitted. Is it possible that some organizations made these late submissions because the Government asked them to? If submissions are closed they should be closed to everyone. If the consultation is open, it should be open to all. Doing it this way at the very least gives the appearance of impropriety: it appears that submissions are closed unless they says what the government wants to hear. This simply further undermines any credibility of the consultation may have had. Going back to the digEcon submissions page again tonight (Thursday 22, July, 2010) things have again changed. Duplicate submissions– or at least some of them, including my initial submission — have been removed. I can’t say either way if there are more or fewer submissions, but my numbers seem a wee bit off. There are also menu options at the top of the submissions list which allows selection of a listing of submissions by Individual or Organization as well as by “most recent”, which may or may not have been there before. It would have been extraordinarily helpful had it been there/had I noticed before. At this time I don’t have any more time to sink into this article, so I think it’s time to cut to the chase. The strangest submission I looked at was this: The Minister of Industry’s Advisory Committee on Assistive Devices for Persons with Disabilities, or ACAD. The digEcon is supposed to be a public consultation, but this submission was made by an Minister of Industry’s Advisory Committee. Don’t they already have access? Even more troubling, this Government Committee didn’t actually write the submission, it was made by an outside PR firm. What’s up with that? My vote for the most incredible submission made by a corporation is the one made by Adobe Systems Canada Inc.. This submission caught my eye as one of the very few submissions made in plain text rather than sealed into an Adobe PDF requiring the use of the proprietary Adobe reader. It seems Adobe knows when it is appropriate to use PDFs. Of the small number of submissions that were made, there does seem to be some variety. Online News Media, Educational Institutions and Library Associations made submissions. Industry Associations, Professional Organizations, Citizen Lobby Groups, Special Interest Groups, Corporations and Content Creators made submissions. The Internet “backbone” is made up of “Carriers”, or the companies that control the wire that the Internet travels across, namely telephone and cable wire. Internet Service Provers, or ISPs connect to the Internet through the carriers. Some ISPs are branches of the same companies that are carriers. In addition to being Internet carriers and ISPs, many if not all of these corporations are involved in other businesses as cell phone providers, broadcasters and content creators. This certainly seems to be a recipe for anti-competitive practices at the very least, and certainly is Canada’s largest barrier to net neutrality. Bell in particular is appears to be many different companies on paper, but in reality these are a family of Bell companies, who share similar if not the same goals. I’ve included CTVglobemedia in the Bell/Telus group since Bell is a major shareholder. Submission of Quebecor Media Inc., on behalf of itself and Videotron Ltd. Independent ISPs acquire Internet access through the same carriers and the same wire as the carrier ISPs. The Independent ISPs compete directly with the carrier/ISPs. The disproportionately large volume of input from the Bell/Telus group in particular worries me. Because Bell thinks decreased Canadian Internet participation is a good idea. This seems like the absolute worst thing that Canada could possibly do in terms of growing a Digital Economy. Any proposal on how the Canadian Government should manage Canada’s Digital Economy from a corporate entity that believes reducing Canadian Internet participation is a good thing makes me very nervous indeed. If you haven’t already, sign the petition. There are only 10897 signatures. Because Usage Based Billing will harm both Canadians and our Economy.